Oh really? Matt Lauer left wife then came crawling back after affair. Home Scandal and Gossip Oh really? Matt Lauer left wife then came crawling back after affair. Did a purported affair lead to Matt Lauer and his wife having another blow out? Master of perfect tea manners Matt Lauer has managed to re instate himself in tabloid land with revelations that the beleaguered Today show host walked out on his wife over the summer only to come crawling back to her after a purported affair went bust. The report comes courtesy of radaronlie who tell that ‘sources’ (define sources) reveal that Matt Lauer ‘walked out’ on his Dutch model wife, Annete Roque and their kids Hamptons over the summer, taking up residence in their Manhattan apartment. 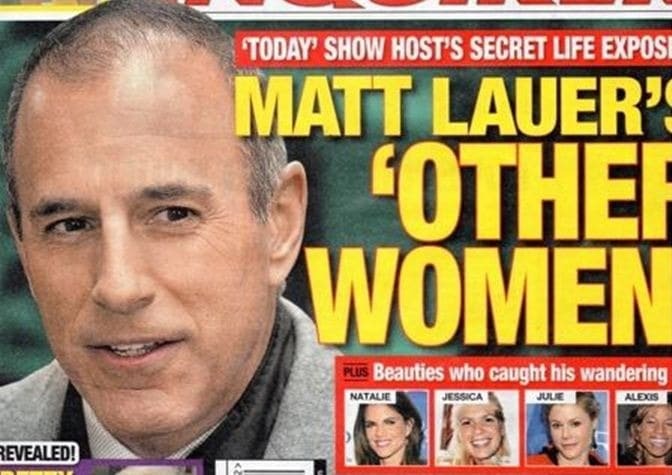 Matt Lauer’s wife to follow him to London cause she’s afraid he might cheat with Today’s Natalie Morales. Matt Lauer’s wife threatened to divorce him if Natalie Morales became Today co anchor. Sources would continue to tell says the outlet that the break away was sparked by a ‘bitter fight’ (define bitter) after published photos of the tv honcho ‘relaxing‘ on a boat with a mystery blonde in the Hamptons. Matt hadn’t taken a holiday in three months. Hmm. Kids I’m curious when was the last time you ever took a holiday? Rest assured the mayhem was all put to rest after our collective hero later begged Annete back ‘for the sake of their three kids’ and the family was reunited under the same roof. At present it is not necessarily understood if the summer break away was precipitated by allegations of a purported affair or just Annete vexed that Matt might be up to old tricks?